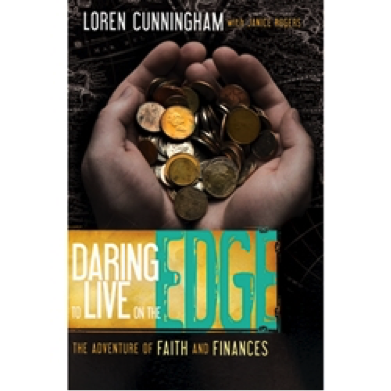 Loren Cunningham’s Daring to Live on the Edge is filled with testimonies meant to challenge us to life an extraordinary life. Living by faith is not the domain of only those Christians called to “full-time” ministry. Every Christian can enter into the adventure. What is important is not our vocation, but whether we are committed to obeying God’s will in our lives. If you are willing to step out in faith and trust in God, doing whatever it is He has asked you to do, then you will see His provision. Once you have experienced this, you will be spoiled for the ordinary. Summary- Chapter one is all about God’s provision. It is filled with stories of how missionaries have been at their wits end on how to continue in their own strength. God always comes through and provides for them in ways they did not expect or imagine. The same applies for our finances when we surrender them to God. Chapter 2 - Have You Ever Seen a Worried Bird? Summary- Chapter two focuses on the issue of worry. It is a chapter that encourages laying worry down and to take after the birds which never worry about a thing. We stop worrying by trusting in God’s care and following his path laid out in the Bible. Chapter 3 - Why Live By Faith? Summary- Chapter 3 shows that we have to stop trusting in ourselves. When it comes to finances, man will always fail himself. God on the other hand has the ability to lead in ways that will never fail. Our faith shows that he exists and is active. Summary- Chapter 4 revolves around the idea that money is not evil. Yet although money is not evil, it can lead to evil things if we allow it to. God is in control of all the money so we trust that he will send what we need. Summary- Chapter 5 aims to show that Satan is always looking to deceive and ruin people. One way he does this is through money. Money allows for lust, pride, and fear. To avoid his use of money, believers must employ Godly principles to handle their money. Note- Living by faith in this world is like flying a plane through cloudy weather. We must rely on outside resources instead of our experiences. Principle 1: We should be wise with our finances, but not worry about them. God will provide for us. Principle 2: We should make sure that God is first in our hearts. Principle 3: We should work. Everyone has an innate desire to be productive. Watch out for idleness. Principle 4: We should invest our time, talents, and finances wisely and watch the growth happen. Principle 5: We should be generous because “everything [we] are and have belongs to God” (pg. 71). We should seek God’s council before financial decisions. We should trust God with our finances. He will take care of us. Quote- “Choosing not to worry [about money] will require as much power of will as it would for a pilot to rely on his instrument panel rather than his own sense while flying through fog” (pg. 66). Summary- It is voluntary and will produce joy. There are four types of people, the breadwinners, the poor and needy, the sent ones, and the manna people. The breadwinners are the majority of people and are provided for by their work. The poor and needy are provided for through the breadwinner’s generosity. The sent ones are nonprofit missionaries and they are also provided for by the breadwinner’s generosity. The manna people are people who are provided for directly from God. This is more rare and is usually not for long periods of time because God wants us to be generous so that we can receive the blessing. Quote- “Generosity is always based on the proportion of the gift to what the giver owns” (pg. 74). Quote- “[Giving] comes first out of love for the Lord, then love for people” (pg. 75). Summary- Giving and supporting each other builds relationships. God’s focus is to restore our relationship with him and our relationship with each other. We need to rely on each other in Christian love. It is a humbling experience to accept a gift from someone when it is something that you truly need. Missionaries need more than money. They need prayer and emotional support from people. Missions the Jesus way is to be supported by people on a personal level. We should not give with the intent to control. We should see money as simply a means to further God’s kingdom. Quote- “We don’t need more money in the body of Christ. We need to get more money flowing” (pg. 96). Summary- All of us have a spiritual calling from God. We must pray to God to seek his guidance for our lives as well as have a willing heart. Christians are very capable and should, if called, pursue professional careers. Christians should be servants in their careers. We should make sure to take a seventh day of rest. Gaining wealth is not a bad thing, but we should be careful to keep our eyes on God and look to him for guidance on where to invest. Be open to God’s guidance. Quote- “Christians who are moving in integrity will make a mark not only for their business, but for the Lord whom they serve” (pg. 103). Quote- “The first thing that Christian business people should know is that they are missionaries and that they need to have a calling, then the second thing is to realize that the Holy Spirit is committed to their excelling in that calling” (pg. 101). How do we submit to God’s will for our giving and decide where to give in a world where we are constantly bombarded with avenues to give? We should always seek God’s guidance when we are presented with an opportunity to give. We should ask God if we should give and how much. We should develop a world mindset with our prayer and giving. Spiritual leaders should set the example for giving. We should trust God with our finances and live in faith, giving generously. Quote- “The only way to remain sane, solvent, and soft in our hearts is to ask God to direct our giving” (pg. 112). Quote- “Find out about the whole world, pray for the whole world, and as God leads you, give to the whole world” (pg. 117). Summary- If God is calling you into missions, don’t worry. He knows all your needs, big and small, and will provide for all of them. You may be called to share your needs with others or keep them private. Five questions to ask yourself first are; is God telling me to do this, how much will it cost, what do I already have, am I to tell others about my need, and what do I do to get started? Summary- When raising support it is important to know what to do and what not to do. Don’t use guilt to ask for money, make financial appeals on the basis of pity, appeal to greed, appeal to fear, or appeal to donor’s pride. Do keep your priorities right, ask the Lord to bring to mind people He has given the gift of giving to, maybe have someone ask for support on your behalf, remember that obedience is more important than money, and always remember you never outgrow the need for guidance. Summary- How does wealth fit in with Christianity? There is no one-size-fits-all answer. We must seek God and His will for how we are to live. It also depends on what cultural context we are living in; we should not live above or below those whom we are serving. We need to beware of greed, avoid envying others, be content, and keep giving as the Lord leads us. Summary- What do you do when you believe that God has called you to something and then all your money runs out? God provides, but there are some questions you have to ask yourself. Do you love things more than you love God? (Materialism) Have you missed the will of God? Are you in debt? Have you been tithing? Have you been generous? Have you been grateful for God’s provision? Have you been faithful in the small things? Have you asked God to supply your need? Are you more interested in learning what God is trying to teach you or in having your needs met? Have you been working hard? Have you been looking to God for provision, or have you looked to other people or yourself? Summary- It can be hard to wait on money to come in, but those times are important for growing your faith. Often God uses those times to remind you to rely on Him and to show His provision in amazing ways. Try to avoid comparing your situation to others. God can use this time to show you what you truly need versus what you think you need. You should journal and recount the past times that He has been faithful.